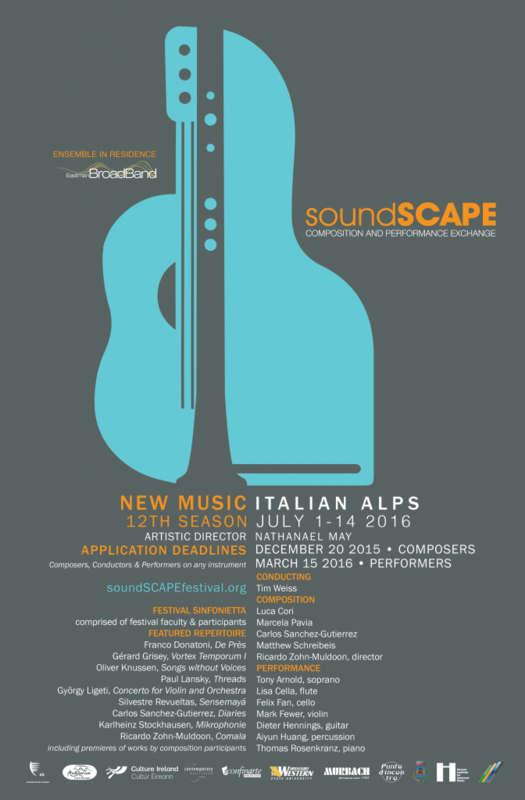 • soundSCAPE encourages applications from performers on ANY instrument, including vocalists and conductors. • BroadBand is a flexible ensemble based in Rochester, New York, featuring current students and recent alumni of the Eastman School of Music. • Composer applicants selected to write for BroadBand will be notified by January 15, 2017. • Two applicants in percussion will be selected to perform with BroadBand at soundSCAPE. • Comprised of performance applicants and members of Eastman BroadBand with Festival Faculty. • accepting auditions on flute, oboe/english horn, clarinet, bassoon, trumpet, horn, trombone, piano, saxophone, percussion, violin, viola, cello, bass. • Composer applicants selected to write for the Sinfonietta will be notified by January 15, 2017. • Ranging from two to six players, each group will include a member of Eastman BroadBand or Festival Faculty along with participant performers. • accepting auditions on all instruments (as listed under Sinfonietta above), including guitar, voice (all types), and any other instrument. • Composers selected to write for chamber groups will be notified by January 15, 2017.
soundSCAPE facilitates the flowering of new music and the exchange of ideas and culture between musicians of tomorrow’s generation. Each summer in idyllic Maccagno, Italy, soundSCAPE attracts composers and performers from around the world for two weeks of concerts, lectures, master classes and workshops. The essence of the festival is process and collaboration – soundSCAPE has been the starting point for new music initiatives that have flourished long beyond the festival, all around the globe. We approach all music with open ears and a passion for making your voice heard… please join us for a celebration of new music in 2017! Established in 2005, soundSCAPE is directed by Nathanael May.